Stocks - After selling off because of trade worries and the Fed on Wednesday, stocks ramped higher on Thursday. S&P 500 increased 1.09%, Nasdaq increased 1.42%, and Russell 2000 increased 1.25%. Apple helped drive the gains as its stock increased 3.68% on excitement over its streaming and news services as well as its new product launches: the iPad mini, AirPods, and iMac. The stock is now up 37.2% since January 3rd. CNN fear and greed index increased from 62 to 68 which signals greed. One or two more rallies could put it in the extreme greed category. The S&P 500 is up 4.08% since March 8th which is an amazing streak within an amazing quarter as it is up 13.88% year to date. I have looked very foolish when I have mentioned that this type of rally can’t continue. In the long run, stocks can’t keep increasing that much per quarter, but if you missed out on the gains in the past few weeks because of this belief, you vastly underperformed the market. S&P 500 needs to rally just 2.66% to reach its record high from September. The market seems destined to surpass that mark regardless of the fundamentals. At some point, the sluggish economy will put a ceiling on this exponential rally, but the time isn’t now. 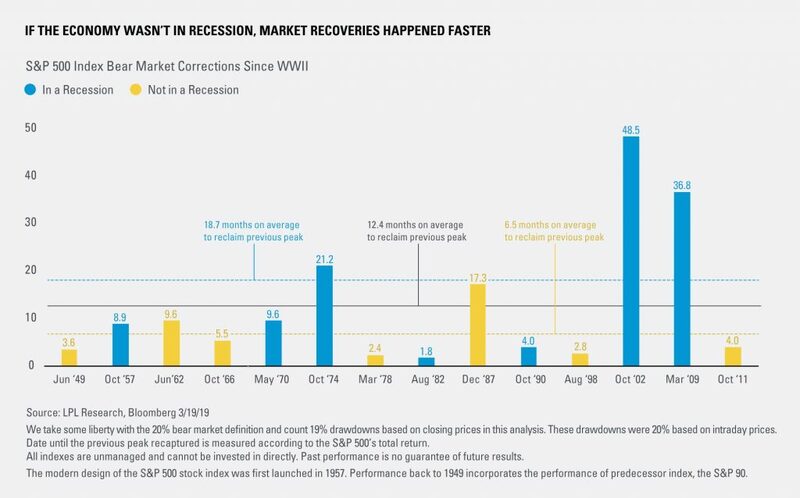 As you can see from the chart below, when the economy isn’t in a recession, it takes 6.5 months on average for the market to reclaim its previous peak after a 19% or greater losses. Since the S&P 500 peaked 6 months ago, it is 2 weeks away from reaching the average. It’s reasonable to expect the market to hit the average as it can rally slightly more than 1% per week. This chart includes the S&P 500’s total return, but there aren’t that many dividends paid in 6.5 months. It’s close to what prices show. There’s no need to look at how stocks do after recessions because it’s clear the economy isn’t in one. My biggest concern is that the economy hasn’t shown signs of recovering from this slowdown. Other than what the ECRI leading index and the yield curve show, I don’t have conclusive evidence where the economy will be in Q2 and Q3. I don’t think it will be in a recession, but an elongated slowdown wouldn’t justify this face ripping rally. Every sector rallied on Thursday except the financials which fell 0.3%. They should be falling because the yield curve is very flat and interest rates have fallen dramatically in the past 6 months. XLF financials ETF is significantly underperforming year to date because of its 3.12% decline in the past 3 days. It was within 1% of the S&P 500’s performance before that. Now it’s only up 8.49% in 2019. The two best performers on Thursday were technology and real estate which increased 2.47% and 1.79%. The tech sector was helped by Apple which rallied significantly as I mentioned earlier. The semiconductor industry as measured by the SOXX ETF ramped higher as it increased 3.45%. It’s up 24.01% year to date despite the weakness in global sales. Clearly, investors see a sharp turnaround coming. They are jumping the gun, which is sometimes what it takes to make money. By the time everyone sees the sales improvement, most of the gains will have been had. That’s similar to the U.S. economy and the S&P 500. Stocks - The real estate sector loves lower interest rates. Since the average 30 year fixed mortgage rate increased 6 basis points to 4.41%, in early March, it has fallen to 4.28% which is the lowest rate since February 2018. I mentioned when the rate ticked up that it would restart its decline soon. It should continue to fall in the next few weeks, setting up the spring selling season for solid growth. The MBA Mortgage Applications index increased 1.6% weekly in the week of March 15th which is on top of 2.3% growth. This time growth came mainly from refinances as they were up 4% on top of a 0.2% decline. The purchase index only increased 0.3%, but it was on top of a 4% gain. Year over year, the index is up 1% which means it decelerated from last week. Even with these low rates, we’re only seeing a modest uptick in buying. The good news is the first report from the spring season is the next one, so there’s still hope for strong results. 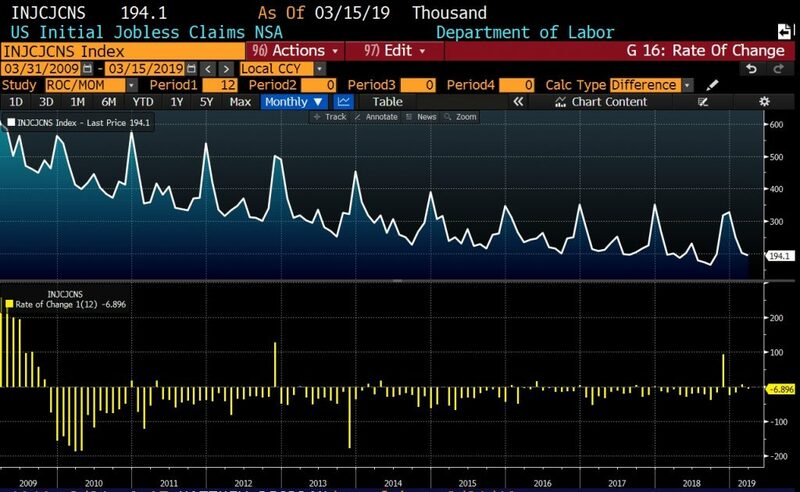 One of the strongest hopes the bears have held onto during this relentless rally in the stock market is that jobless claims have bottomed. That’s irrelevant if they don’t significantly increase and so far, they haven’t. Initial claims fell from 230,000 to 221,000 which was below estimates for 225,000. The 4 week average increased 1,000 to 225,000. It’s great that claims fell because that was the sample week for the monthly BLS report. This sample report is 4,000 higher than the sample report from last month. Last month’s BLS report showed only 20,000 jobs created. That doesn’t mean the BLS report will be worse in March because clearly the relatively low jobless claims last month weren’t correlated with the weak BLS report. The chart below shows the non-seasonally adjusted unemployment claims. Sometimes the bears are skeptical of seasonal adjustments, but as you can see, the seasonally adjusted claims are higher than the non-seasonally adjusted claims which are 194,100. This chart indicates claims aren’t that much higher than their cycle trough. The stock market is very close to hitting record highs. It is right in line with the average bear market recovery. The gains have been fierce when you consider that we are just heading into the first negative earnings growth quarter of this slowdown. Investors are betting it will be the only decline on a yearly basis. The MBA Applications purchase index wasn’t amazing considering the sharp decline in rates. Low jobless claims should mean the March BLS report will show rebounding job creation.